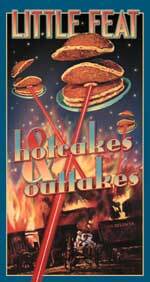 CD review: "Hotcakes & Outtakes"
This review first appeared in the October 8, 2000 edition of the American Reporter. Little Feat is one of those very few bands that has managed to grow beyond the limits that playing "rock" music seems to impose. Covering much of the same territory as fellow veterans The Band, Little Feat can hold a groove with the Tower of Power and War, has a stronger country streak than either the Eagles or Poco ever had, is as immersed in the blues as Santana, and brings as much jazz to the table as Steely Dan and King Crimson. Oh, and these guys can out-jam just about any band on the scene  that's probably the lesson that Rhino's new four-CD box set retrospective drives home more than any other. It is this stellar ability to simply play that is at the heart of Little Feat's three decades of success. The fact that every one of them is an accomplished instrumentalist and imaginative improviser has allowed them to survive changes in popular music that make it difficult for them to get airplay; the fact that they still love to get on stage in front of their fans is what brought them back together after the 1981 death of founder/lead singer Lowell George. Bill Payne (keyboards), Paul Barrere (guitar), Kenny Gradney (bass), Richie Hayward (drums) and Sam Clayton (percussion) remain one of the tightest ensembles around  and one of the few rock groups that can hold its own at a jazz festival. And when Fred Tackett was added to the band at their reformation in '88 to replace George's guitar spot (with Barrere now taking George's old slide leads), that hardly hurt the band's sense of musicianship. Three of the four discs are devoted to the band's original incarnation, the one in which George was still around writing and singing. With songs like "Tripe Face Boogie," "Willin'," "Dixie Chicken," "All That You Dream" (which Linda Ronstadt later made into a huge hit), "Fat Man in the Bathtub," "Oh Atlanta" and "Time Loves a Hero," it's easy to see why Little Feat was able to please both the press and its audience. The other disc is taken from the band's releases since reforming in '88. Originally, the new lineup had ex-Pure Prairie League singer Craig Fuller, but the band is now fronted by vocalist Shaun Murphy, whose femininity has added yet another new dimension to the band's sound. Regardless of who's doing the singing, though, Little Feat has continued to turn out music both challenging and listenable.